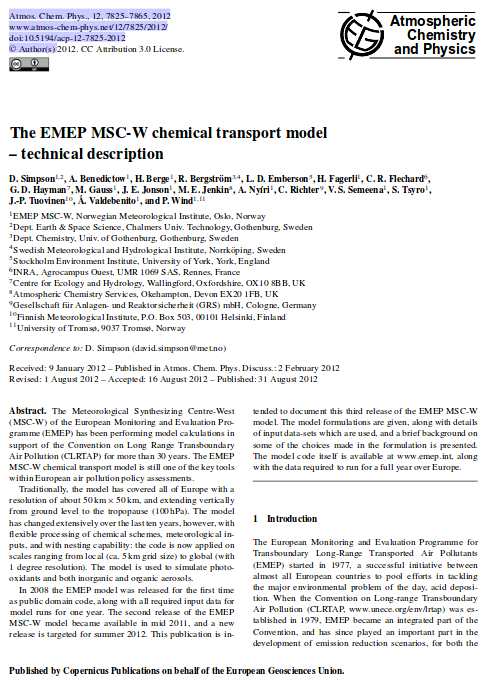 The chemical transport model developed at Meteorological Synthesizing Centre - West (MSC-W) is called the EMEP MSC-W model. The model was released as OpenSource code in 2008 and is under continous development for meeting new tasks within the EMEP programme and other projects. Acidifying and eutrophying pollutants originate primarily from anthropogenic emissions of sulphur dioxide (SO2), nitrogen oxides (NOx) and ammonia (NH3 ). Most of SO2 and NOx is emitted to the atmosphere under the combustion of fossil fuel in electricity generating power stations, industrial plants, residential heating, commercial and service sectors. Road transport, shipping and aircraft are significant sources of NOx emissions. NH3 emissions are related to agricultural activities such as storage of manure, soil fertilising, animal husbandry, etc. When emitted to the atmosphere, acidifying and eutrophying pollutants may remain in air for several days and therefore, be dispersed and carried over long distances by winds. They can be transported across national boundaries and cause damaging effects far from the source of emission. Acidifying pollutants are removed from the atmosphere by wet ("acid rain") or dry (direct uptake by vegetation and surfaces) deposition. Effects of acid deposition are widespread and appear in a number of ways, including e.g. acidification of freshwater systems resulting in the loss of fisheries, impoverishment of soils, damage to forests and vegetation, corrosion of buildings, cultural monuments and materials. The man-made gaseous sulphur and nitrogen emissions are precursors to the formation of small particles (PM2.5) which impact human health. Deposition of nitrogen-containing compounds also contributes to the eutrophication ("excess nutrient enrichment") of terrestrial and marine ecosystems. Their eutrophying effect is associated with increased leaching of nitrogen to ground water, streams and lakes and changes in the forest ecosystems leading to vegetation changes favouring nitrogen-tolerant species. A number of man made pollutants, as nitrogen oxides and volatile organic compounds (VOC), that can affect the photochemical activity, are emitted into atmosphere. Nitrogen oxides are emitted mainly from combustion processes from both mobile sources (e.g. road traffic) or stationary sources (e.g. power plants ). VOC are emitted from combustion and also by evaporation of fuels and solvents. Furthermore natural emissions, in particular of hydrocarbon from trees, will also contribute to the photochemical activity. In the atmosphere these pollutants may react, producing other toxic pollutants (mainly ozone). The production of ozone require sunlight. Therefore ozone above what is considered harmful for the environment or for humans is mostly a problem in the summer months. Both observations and calculations have shown that ozone has increased on a local and regional scale in the European boundary layer. Furthermore, ozone has increased by approximately a factor of two throughout the lower atmosphere in the northern mid latitudes since early this century. Exceedances of ozone considered harmful for humans and for the environment is most frequent in central and southern parts of Europe. Close to the surface nitrogen oxidants, hydrocarbons and ozone itself can build up in what is called ozone episodes. In northern parts of Europe exceedances are not as frequent mainly because the solar radiation is weaker further north. Both measurements and models show that there has been a reduction in the magnitude of such ozone events in Europe since the late 1980's as a result of emission reductions of ozone precursors over the same period. To avoid such pollution events emissions must be further reduced. However the chemical mechanisms involved are complicated and there are still uncertainties as to how reductions should be made cost effective (The maximum amount of reductions for a given sum of money). In particular for nitrogen oxides reductions are desirable also for other environmental reasons as acidification and eutrophication. The impact on human health by atmospheric particles was the recognized driving force for the extension of EMEP framework to include particulate matter. Aerosols also affect the radiative balance and thus contribute to climate change. The preliminary assessment by WHO-EMEP (WHO-EMEP, 1999) indicated a significant association between the long range component of particulate matter, measured as the total mass of PM10, and a wide range of health damaging effects. It was specifically highlighted that PM from long range transport contribute significantly to these effects. Based on a number of more recent epidemicological studies supported by toxicological evidence, WHO review (WHO, 2006) concluded that fine particles (PM2.5) are more hazardous in terms of cardiovascular and respiratory mortality. It was therefore recommended to also use PM2.5 as the indicator for health effects induced by particulate pollution (WHO Air Quality Guidelines, WHO, 2006). On the other hand, coarse particles may have more visible impacts on respiratory morbidity. However, current knowledge does not allow attributing the observed health effects to a particular characteristic of PM, nor precise quantification of the health effects of PM emissions from different sources or of individual PM components. Thus, current risk assessment practices should consider particles of different sizes, from different sources and with different compositions as equally hazardous to health (WHO, 2007). In the last years, the compilation of data on particulate matter (PM) in Europe has become one of the main topics within EMEP. Both modelling and measurement tools have been used to assess PM concentration level and chemical composition. 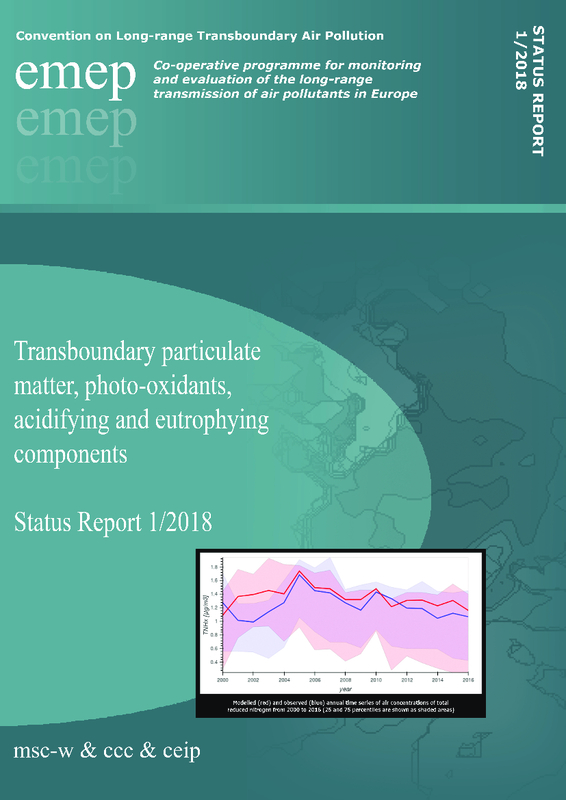 The EMEP database contains monitoring data on a rather large number of chemical and physical parameters of aerosols, but the sampling sites are in general distributed inhomogeneously. EMEP aims at establishing and extending monitoring of fine particles and aerosol chemical composition complementary to PM10 measurements. Two models of different complexity and purpose to calculate PM have been developed at MSC-W: the Unified EMEP Model and the research aerosol dynamics model. Concentrations of PM10, PM2.5 as well as of the individual aerosol components (SO42-, NO3- and NH4+, organic and elemental carbon, sea salt and mineral dust) have been calculated every year since 2000. Model results have been as far as possible verified with measurement data available from EMEP and other sites. The Unified EMEP model was from 2003 and onwards to calculate source-receptor relationships for Secondary Inorganic Aerosols (SIA), PM2.5 and PM10 and also to provide aerosol concentrations for the website. Information about the Unified EMEP and aerosol models can be found in EMEP Status Report 1/2003 Part I . The latest EMEP/MSC-W model Open Source code with the most recent input data and model results for comparison is updated every year. 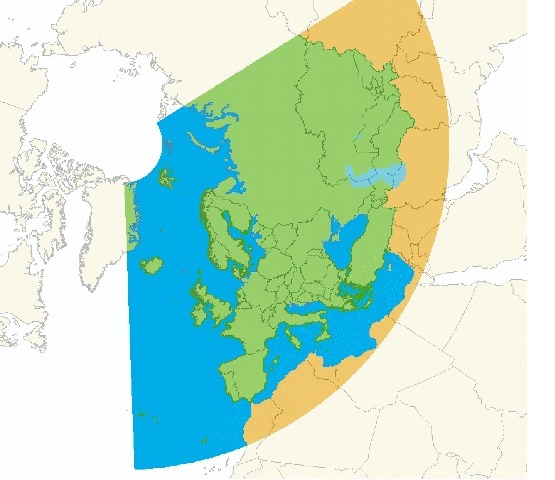 The UNECE/EMEP emission database WebDab has been constructed in purpose to facilitate the access to the emission data reported to the Convention on Long-Range Transboundary Air Pollution (CLRTAP) on Main Pollutants among other compounds. Measurement data is available for all EMEP stations. 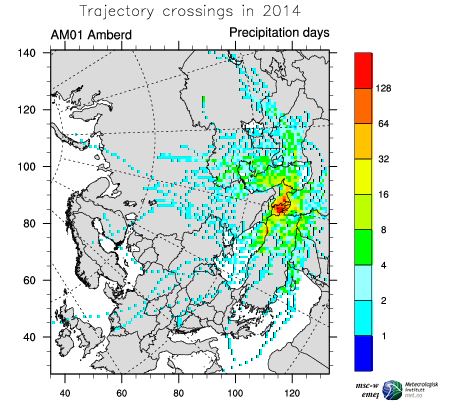 Modelled air concentration and deposition data are downloadable files covering the EMEP grid. And also the source-receptor relationships by country of sulphur and nitrogen, ozone and PM are downloadable as CSV tables. The chemical transport models developed at Meteorological Synthesizing Centre - West (MSC-W) are concerned with the regional atmospheric dispersion and deposition of acidifying and eutrophying compounds (S, N), ground level ozone (O3) and particulate matter (PM2.5, PM10). Until 1998, 2-D Lagrangian Acid Deposition model was routinely used at EMEP/MSC-W. In 1989, the MSC-W of EMEP began the work on the development of an ozone model of adressing both the problem of short-term episodic ozone and long-term (growing season) ozone. The model was called in the beginning the Lagrangian Ozone model and is also known as the Lagrangian Photooxidant model. The EMEP Lagrangian model was not explicitly designed to model particulate matter, but it calculated air concentrations of four secondary particles: sulphate, nitrate, ammonium sulphate and ammonium nitrate. In 1997 results from the EMEP Eulerian photooxidant model were presented for the first time. In 1999 3-D Eulerian Acid Deposition Model was applied to calculate air concentration and deposition fields for major acidifying and eutrophying pollutants as well as their long-range transport and fluxes across national boundaries. In 2002, the Unified EMEP model, was introduced; A modelling system that unified the acidifying and the oxidant versions of the eulerian model. The Unified EMEP model code (version rv3) was released as open source under the GPL license v3 in February 2008. The release of the code included also a full input data set for 2005 and model results for comparison.